The Emotion Code - SO FAR SO GOOD ! 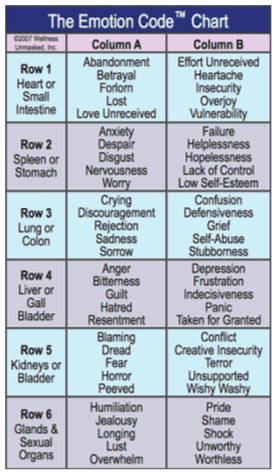 The Emotion Code is an energy healing technique (developed by Dr. Bradley Nelson) that helps us to identify and literally release trapped emotions - which are harmful emotional energies from negative past events. Trapped emotions can cause depression, anxiety, they can block people from love and happiness and make them feel disconnected from others. Because trapped emotions are made of energy, just like the rest of the body, they exert an influence on the physical tissues, and can cause acute pain and even cancer. Releasing trapped emotions makes conditions right for the body to heal - so physical and emotional difficulties often disappear or become much more manageable. The trapped emotions are identified using muscle testing* and are released by rolling magnets** down the Governing Meridian (down your spine – it feels nice!). With animals I can work through a surrogate or proxy*** if rolling magnets on them directly is not an option. Just about everyone has some emotional baggage from painful life events. It's not all in your head! Emotional baggage is very real, and although it's invisible it can really mess up your happiness, your success and your health. It's like lugging around a suitcase from every difficult event you've gone through- eventually the load gets too heavy not to notice. I call each "suitcase" a Trapped Emotion - a bit of emotional energy that was created, by you, during an emotional event, and got stuck in your body somewhere. of them using The Emotion Code and lighten your load for good! Muscle testing is a non-invasive tool we can use to identify imbalances in the body. The science behind it is similar to a lie detector test or a polygraph. In a polygraph, a person is hooked up to sensitive electrodes and asked certain questions. The person's answers generate a certain electrical response in the body, which is read and graphed by the machine, showing if the answers are true or false. This is done on a very delicate, minute scale. The muscles of the body are also affected by this electrical state - so we can use them to show this same response, just on a more pronounced, larger scale. Any muscle will become weakened in a state of incongruence or falsehood, making resistance difficult. Conversely, muscles will remain strong and able to resist when in a state of congruency or truth. What's nice is that muscle testing allows us to access important information about health, we just have to know what questions to ask, then apply the resistance to a muscle and get our answers! Just like a magnifying glass will intensify sunlight enough to start a fire, magnets can act as an amplifier for the energy of your thought and intention, enough to produce a change in the body. *** Surrogate and Proxy ? Surrogate testing is only used when the person being worked on (the subject) is physically present, either touching or within a few feet (within the energy field). This type of testing is used when the subject is not testable. The practitioner can use self-testing or the subject can ‘plug in’ (hold hands with) another person who is testable. All the muscle testing is done on the surrogate, still on behalf of the subject. The releasing of any emotions is still done on the subject because they are present. Proxy testing is used when the subject is someone who is not physically near the practitioner. The practitioner can become the proxy on behalf of the subject. The muscle testing and the releasing of emotions are both carried out on the proxy. Proxy testing a person/animal is similar to having a wireless connection. In the same way that computer screen-sharing can be used to edit or delete information on another computer anywhere in the world, imbalances that exist in the subject’s body can be identified and released, no matter how far apart the client and practitioner may be. Distance has no bearing on how well this works – it’s really quite amazing! During times of emotional pain or distress, your heart can be really hurt or injured - this is where the words "heartache" and "heartbreak" come from. Sometimes we need to put up a form of protection, or a "wall" around the heart - but you can't build a wall of nothing. The body tends to use Trapped Emotions for "building materials" as they are the most common excess energies in the body. The problem is that the Heart-Wall doesn't dissolve on its own, even if you don't need it any more. Having a Heart-Wall long-term is like living in a bomb shelter – it is necessary short-term to protect you while the "bombs" are falling, but if you continue to "live" in there you'll feel sad, disconnected, frustrated and you could even end up with other heart problems later. The Heart-Wall can be removed, one emotion at a time, freeing you to live from your heart. The body needs a few days to process trapped emotions after they are released. This is a healing time, when you may feel some side-effects of processing the emotions that were just released. Most of the time, processing is pretty mild and isn’t really noticed, you’ll usually feel lighter and less burdened. Other times you may feel some negative symptoms from processing. You may feel some echoes of the emotions that were released, feel tired, light-headed or have changes in your sleeping pattern, vivid dreams or emotional ups and downs. Any unpleasant effects don’t typically last for more than a day or two and they are usually very mild. Animals may need to be allowed to rest if they want to. Drink lots of water, eat a healthy diet and get plenty of rest, and let your energy body heal itself. Animals are often affected when emotionally upsetting events occur and can they can suffer from trapped emotions and Heart Walls. Identifying and releasing trapped emotions for an animal is essentially the same process used when working with a human being.